India has been voted one of Asia's "must-see" destinations in a poll of global travellers, thanks to its stunning scenery and diverse cultural heritage. There is something for everyone in the country's great melting pot, with the most popular attractions being the Taj Mahal at Agra, and Kanha National Park, home to India's trademark tigers. The Ajanta Caves were also one of the top attractions, as were the beach paradises of Goa, with Palolem a particular favourite, the Ipsos poll found. Travellers keen to sample the delights of India should make sure they are covered by travel insurance before embarking on their trip of a lifetime. 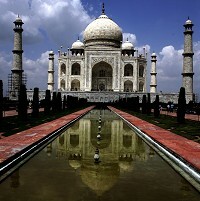 The survey, for the CNN Consumer Connect Travel and Tourism 2013 report, placed India as Asia's fourth fastest-growing tourism destination, and ranked it as the second richest culture and heritage destination behind China. A fifth of more than 3,000 global travellers who were surveyed said India is on their "must-visit" list of Asia Pacific destinations.